Little House Home Arts: Along Came a Spider and Sat Down Beside Her!! 'Twas a dark summer night and not a creature was stirring, or so I thought... except me! I was busy sewing and getting lots done when along came a spider and sat down beside me, half way down the wall next to my sewing table! I ran to the kitchen to get the fly swatter. The spider was at least the size of a quarter with what appeared to be a violin body! Could it possibly be a brown recluse? My imagination never fails me!! I hit it, but only hard enough to bring it down, it without leaving a big smudge on the wall. It dropped to the top of my Gutermann Thread Rack, but it appeared to be stunned and not dead! I took aim again...and this time it dropped into my circular thread rack. Talk about a potentially lethal combination! Reach for thread and get a spider bite instead! 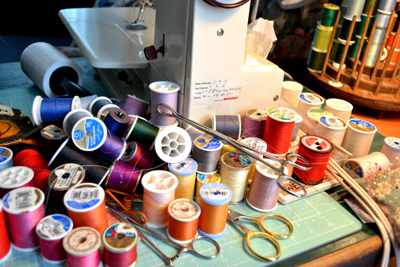 I had to make a plan...I got out my long forceps and started removing spools of thread while waiting for the spider to jump out at me! 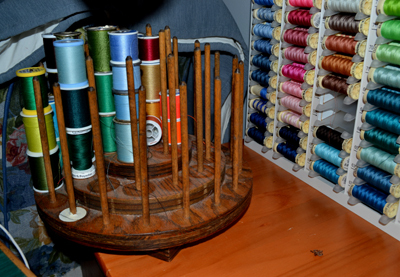 After removing half the spools, I saw it on the top of my sewing notions drawers, next to my spinning thread rack. It looked dead, but I took no chances! I nudged it slightly with the fly swatter to be sure it was dead! It was dead for sure. I then got a piece of cardboard to scoop it up and placed it in a plastic bag. I would look up spider images on the computer to identify it, just like a school nurse I knew who kept bug specimens she had picked off her student patients, keeping her zoo carefully pinned to her bulletin board! We decided it looked more like a wolf spider, which is a relief, as brown recluse spiders are quite poisonous! I then realized how long it had been since I had cleaned out my thread rack. Cleaning it out would be the perfect end to this dreadful experience...or would there be more? There was more trauma in store for me, just not the spider variety. Only a day later, I stepped in "cat puke" in my back pantry room with my bare feet, no less! I hoped this completed my nursery rhyme festivities..."Along came a spider and sat down beside" me scaring me to death...But it was really only "a wolf" finding me without my "Red Riding Hood"...and then stepping right in "it"..... reminding me of Puss and Boots....though clearly it is me that needs to wear boots! Here are photos to verify that this is a non-fiction blog, though I have spared you, my readers, the picture of "cat puke" on my bare feet! Some images should be censored! 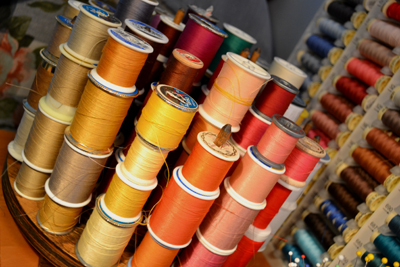 I carefully pulled out my spools of thread using the long forceps. Then I saw it lying on the top of my sewing notions drawers. I was safe at last! 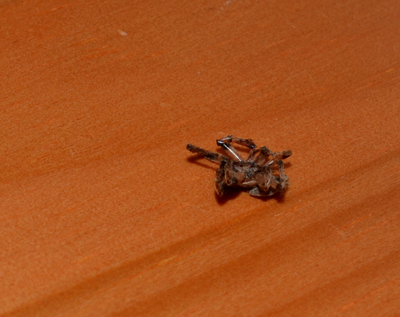 A dead spider is a good spider! 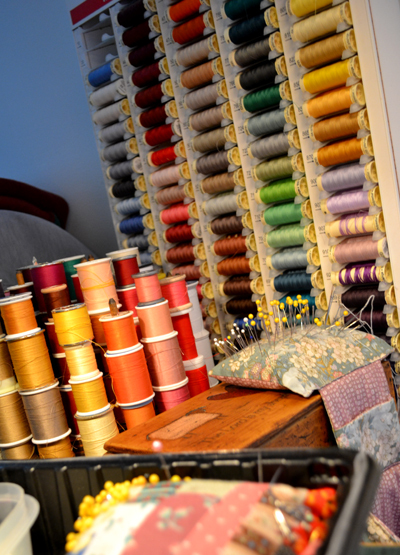 !Then I saw my spool rack...You can see it too! I took all the spools off and cleaned the rack and then loaded my threads. 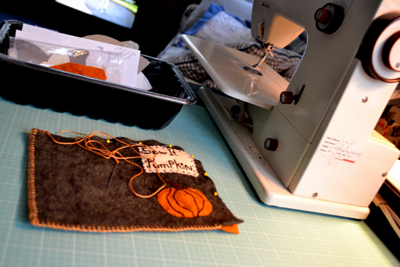 Back to sewing...spider free, or so I hope! Labels: Living nursery rhymes in my sewing studio!